Hawaii may not be your vacation destination this year, but don't worry. This sandwich brings the flavors of the islands to your table. It’s the polar opposite of the quiet, predictable ladies’ luncheon chicken salad. Sauté bacon in a skillet over medium heat until crisp, 8–10 minutes. Drain bacon on a paper-towel-lined plate. Prepare baguettes by slicing top third off and removing bread inside; set aside for another use. Cut whole baguette into 4 equal portions and half baguette into 2 portions. Brush each piece with 1 Tbsp. oil, season with salt and pepper, and broil on a baking sheet until toasted, 2–3 minutes. Process cilantro, mint, gingerroot, and lime juice in food processor until minced. Add mayonnaise and yogurt; pulse to combine. Season mixture with salt and pepper. Combine chicken, nuts, and bacon with cilantro mixture; set aside. Toss spinach with salad dressing. Stir pineapple and jalapeño together in a bowl. 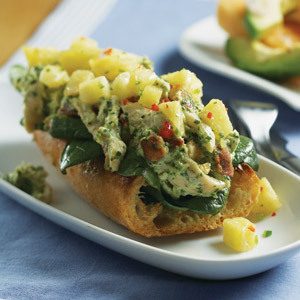 To assemble sandwiches, divide spinach among baguettes; top ech with 1/2 cup chicken salad and 2–3 Tbsp. pineapple mixture. Garnish sandwiches with bell pepper. Create a well for the salad by removing as much of the middle of the baguette halves as possible. Combine cilantro, mayonnaise, chicken, nuts, and bacon for chicken salad. Fill bread boats with 1/2 cup chicken salad — any more than that makes the sandwiches hard to handle.